Da dum, da da dum, da dum, da da Druuuuuuuuuuuummmmm! I played a beat to this while reading, did you? Hello folks. Breaking the silence on the blog front with this Big Boy toy. 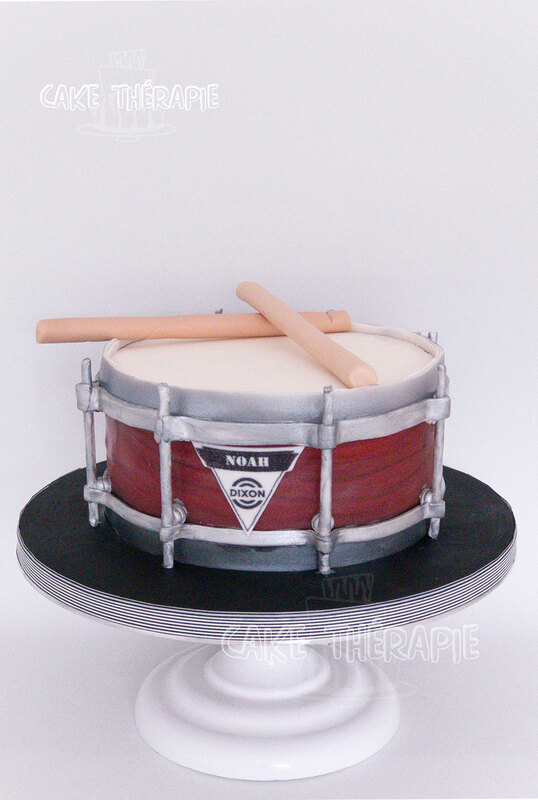 A cake that was a surprise for Noah, who turned 18. He and his dad are part of a band and Noah plays the drums. I don’t know Noah or his dad to share a story about them but I do have a tale to tell about this cake. Let me start with the time line. This cake was due for this Tuesday evening and ideally I would prefer to have the cake fully assembled and boxed by Monday evening or worst case, Tuesday morning. Giving me enough buffer for any contingencies. For lack of time, I left the baking for late Monday night, leaving everything literally everything for Tuesday (bad decision). I always do my fondant figures and decorations ahead of time, giving them enough time to dry but this one I needed to know the height of the cake to make the side lugs. So long story short, it was manic Tuesday at Cake Thérapie (or atleast it was so in my head). 1. Stacking and filling: layering cake and buttercream. 2. Crumb coating: after the cake layers are stacked, cake is covered in thin coating of buttercream to seal the crumbs. 3. Frosting: final smooth thicker layer of buttercream to give the cake its perfect look. And since time was the only thing I didn’t have on hand, I had to jump to covering the cake in fondant way before the cake was ready! The buttercream didn’t have enough time to set and was way too soft to work with. My kid who is home these days enjoying his summer holidays, must have found it hilarious watching his mother sprint with the cake from fridge to worktable, multiple times (though I doubt if he would have ever looked away from whatever youtube game video he was watching). 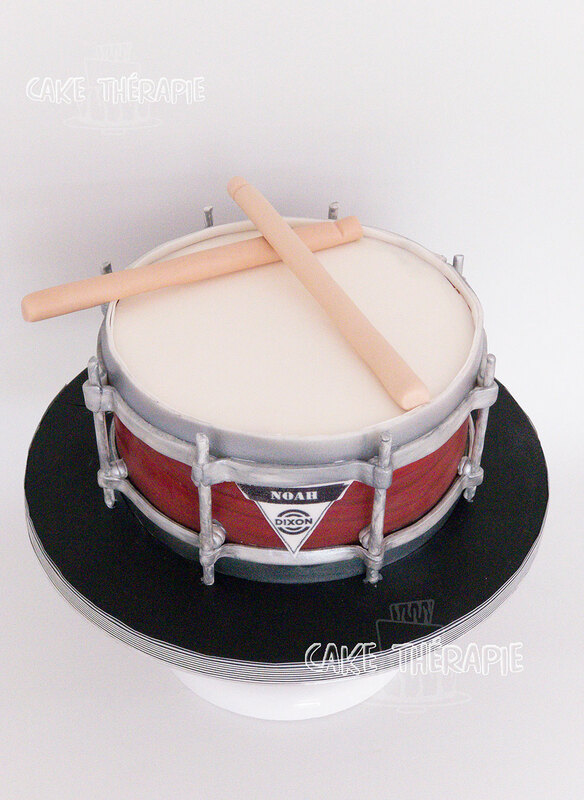 During the little time the cake spent in the fridge, I quickly made the rims, the lugs and the drum sticks. Tick tock, tick tock, tick tock!, that’s is the only sound playing in my head as I know this cake is being picked up at 5 in the evening. Finally the Fondant was on and the cake was ready to be decorated. I added the rims on the top and bottom, the lugs on the side and painted them silver. Finally I finished the board and added the sticks! Cake Thérapie is all about making your occasions unforgettable with 100% home-made custom cakes filled with love!! Monday to Friday 8 a.m. to 6 p.m.